The conservatory in St. Paul's Como Park smells like rotting flesh this morning. 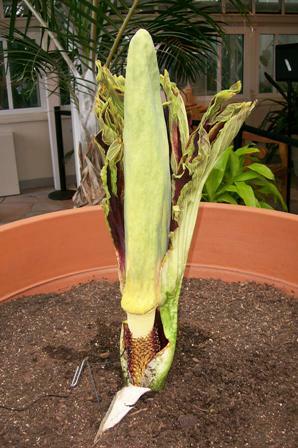 That's because a rare plant called the Amorphophallus titanum, or the Corpse Flower, is in bloom. The flower is native to southeast Asia and nick-named for the unpleasant smell it emits when it blooms. It was discovered in the rainforests of Indonesia in the late 1800s. Since then, there have been about 125 documented blooms worldwide. This is the second one to happen in Minnesota. Morning Edition host Perry Finelli talked with Margaret Yaekel-Twum, a horticulturist at the Marjorie McNeely Conservatory at Como Park.